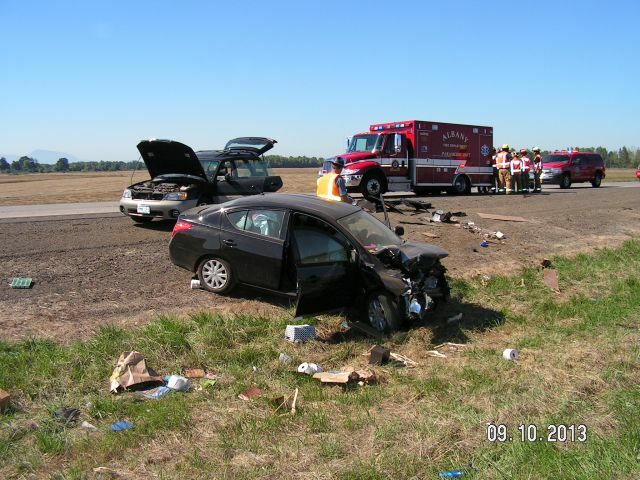 The Oregon State Police provided this photo of the Sept 10 crash on I-5 in Linn County. Almost every day, the Oregon State Police reports on vehicle crashes in which someone was killed or seriously injured. There is a forward-looking point to these reports. They should remind us all that in traffic, being insufficiently aware of potential danger can have terrible consequences. On Tuesday (Sept. 10), for example, a 30-year-old woman from Arizona accompanied by a 10-year-old girl was driving a brand new Nissan Versa south on I-5. She was in the left lane north of the Highway 228 exit. According to the state police, a pickup in front of her suddenly slowed, and she steered to the left, evidently to keep from slamming into the pickup. But a car with a flat tire was parked right there in the median, with three people from Portland in or near the car’s left-hand doors. Two of the people with the parked car suffered grievous injuries and were flown to hospitals in Portland and Springfield in critical condition. The third person and the driver and child in the Versa were also hurt, but less severely. From Tom LePage, on Facebook: I would love to leave room ahead of me. EVERY time I travel at a safe distance, some dipstick fills the gap. And don’t even get me started on all the nitwits who are tailgating these days.